Daily Current affairs Practice bits in telugu for all Competitive exams like DSC, APPSC, TSPSC, VRO, VRA, Panchayati Secretary and many more . 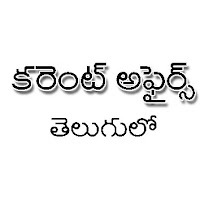 . .
We Place Current affairs Practice bits in telugu in pdf format for all Competitive exams which have Current affairs as a Subject. Therse Current affairs (in telugu) bits Useful for all Competitive exams like APPSC Exams, TSPSC Exams, DSC, TET, Police Constables, FBO, VRO, VRA, Panchayati Secretaries, Sub Inspectors, Bank Exams, Railway Recruitment board (RRB) Exams. Current affairs subject is an important Subject to the students Who are preparing for Competitive exams. Every one suggested to the students to read News papers to cover Current affairs topics to get good score in Current affairs subject in all Competitive exams. Here we try to prepare A current affairs practice test in telugu Daily, basing on the news, Events covered on yesterdays News Paper. This helps the students to motivate to read News paper daily.